Mid-table Fleetwood held out valiantly to record their first North Lancs/Cumbria League victory since November. Conditions were good and the scene was set for an entertaining clash between two well-matched teams in Kirkby Stephen. The first half saw tentative play from both sides, defences leading the way. The Green and Golds didn’t have the best of starts as Owen Brown was forced off with a knock and Jack Brocklehurst was sent to the sin-bin. Eden exerted early pressure but couldn’t break through the defensive line as Mike Kelly and Rob Brookfield tackled heroically. 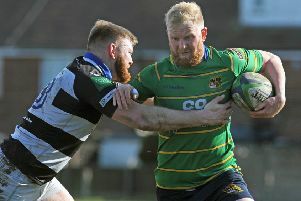 Having absorbed the pressure, player-coach Steve Woodburn drove Fleetwood upfield before centre James Torkington drew his opposite number and sent winger Jack Stapleton in at the corner for the opening try. Stapleton suffered a knee injury inthe process and was replaced by Andy Holme, who was denied a try of his own by a forward pass. Quick hands from a lineout enabled centre Owen Brown to run at the defence and earn a penalty, which Scott Richardson knocked over to give the visitors an 8-0 half-time lead. Eden pressed hard in the second half but Fleetwood defended their lead strongly, with scrum-half Matt Larkin excellent in attack and defence, Karl Bowling showing a mature head on young shoulders and Reece Heer impressive going forward. Upper Eden were awarded a number of penalties but chose to kick for the corner or run the ball in search of a try. They got on the scoreboard on the hour, when a midfield break and a missed tackle saw their fly-half stroll in for a converted try. Richardson was outstanding in open play, even if he couldn’t quite find his kicking boots on the day, while newcomer Devon Brown and the returning Stapleton were among those who helped Fleetwood to hold out. The defeat keeps the Cumbrian club third-bottom but Fleetwood hope to be playing these fine hosts again next season.